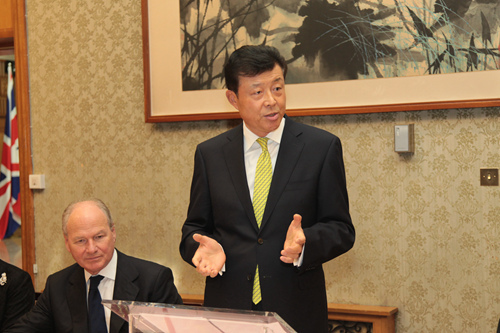 It is a real pleasure for me to host this dinner for British financial community here at the Chinese Embassy. Most of you are old friends. 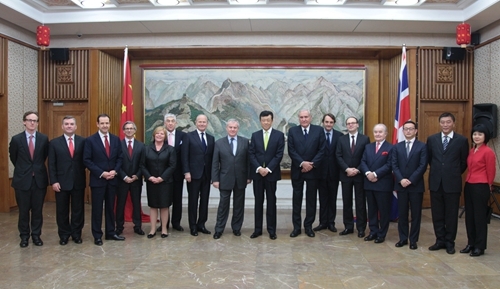 Recently in September, you were in Beijing for the China Financial Services Development World Experts’ Forum 2014. Here I want to warmly applaud the success of the forum and thank you for contributing your views and advice. My appreciation also goes to Alistair Michie, who did a good job in helping organize the event. But I am not hosting this gathering to only say congratulations and thank you. 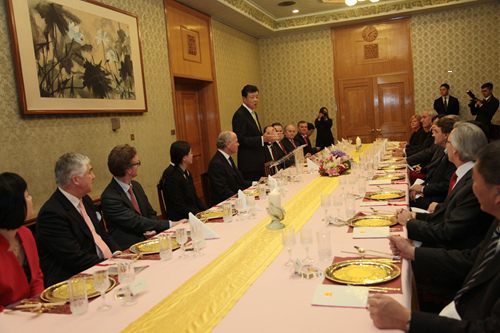 I want to exchange views with you on the current economic development in China and the opportunities therein. So, I will begin by making a few remarks and hope you will come up with your valuable opinions. In a word, I want to show you four major opportunities. The first opportunity comes with China’s economic transition and upgrading. The moderate drops in China’s growth rate in recent quarters are completely in line with expectations. They are the direct result of economic transition and upgrading. l And three, innovation is joining production factors and capital investment as a major growth driver. This “new normal” means that the Chinese economy will grow at a slightly slower but definitely steadier pace. It will have multiple drivers, an optimal structure and promising prospects. The second opportunity comes as China builds a new system of open economy. The Chinese leaders recently stressed on several occasions that opening up is a basic state policy that China will firmly pursue. Thus, it is not surprising that China will further lower the threshold for foreign investment by opening up the service sector. At the same time, we will gather experience with the Shanghai Pilot Free Trade Zone in order to make our economy more open both in depth and width. To this end, we will experiment with a foreign investment management model based on pre-establishment national treatment and negative list. We will also substantially reduce the number of items subject to administrative approval, simplify the approval procedures and strike a balance between inward and outbound investments. The third opportunity comes with advancement in the rule of law. The recently concluded Fourth Plenum of the Eighteenth CPC Central Committee came to a decision on all-round advancement of governance in accordance with the law. In the economic field, China will strengthen and improve macro-regulation and market supervision in accordance with law to curb monopoly, encourage rational competition and safeguard fair play in the market place. China will facilitate the continuous deepening of opening up by improving laws and regulations with regard to foreign businesses. The aim is, again, to build a new system of open economy. Legal services will also be strengthened to protect the legitimate rights and interests of foreign nationals and legal persons in China. I am confident that these measures will guarantee a more equitable, fair and transparent legal environment for foreign financial companies seeking business opportunities in China. The fourth opportunity comes with China’s cooperation with its neighbours. China and twenty other regional countries have jointly established the Asia Infrastructure Investment Bank for the purpose of promoting regional infrastructural connectivity and economic cooperation. China is also committed to the building of the Silk Road economic belt and the 21st century maritime Silk Road. We have already pledged forty billion US dollars for the establishment of the Silk Road fund. The 22nd APEC Economic Leaders Meeting concluded last week agreed to foster an open economy in the Asia-Pacific featuring innovative development, interconnected growth and converging interests. This was a major decision on launching the FTA process. It sketched out a brand new blueprint for an Asia-Pacific connectivity network. The China-ASEAN summit that followed came to an agreement on upgrading the China-ASEAN FTA and strengthening connectivity and maritime cooperation. As China continues to develop, it will take its neighbours with it, and that will bring new vigour to Asia-Pacific regional economy. I am sure these four opportunities are welcome news to British financial service companies. They entail solid real economy, open and fair market, sound and reliable legal system and favorable regional environment – all of which are indispensable for financial services to develop in China. I therefore hope that you will all seize the opportunities, work for greater development of your business in China, and contribute to taking China-UK economic and financial cooperation to a new and higher level.